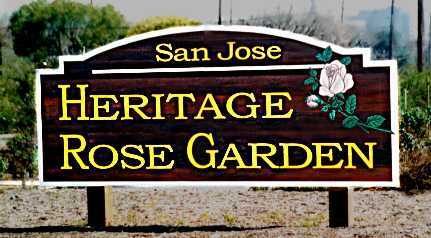 We have been getting questions about how to make donations to the Heritage Rose Garden, so here is the way to do it. As we have no mailing address or bank account, our funds are handled by Guadalupe River Park Conservancy. The money for the rose garden goes into the Mel Hulse Fund. We use the funds to order more roses from nurseries, and other items needed for repropagating our roses. A number of donors have asked us to use their donation to buy roses from a particular nursery, in order to help that nursery stay in business as well as help the rose garden. If you have a particular request like that, put it in a note with the donation, and we will honor the request. We want to keep heritage rose nurseries in business, too! There is also a way to make an online donation. Guadalupe River Park Conservancy has a website with a place to make donations, and they have added a section where you can donate to the Mel Hulse Fund. Here is a link to their donations page. A small transaction fee may be deducted from the donation. Adopt a Rose! This is a program that raises money for the plaques in front of each rose that give the name and other information about the rose. You can have an inscription on the bottom part of the plaque. They cost $50 per year, and are available on this Guadalupe River Park Conservancy link. Thank you for your interest in helping the garden! This page was last updated on 08/04/10.